Patricia Baldwin Seggebruch is known for her dynamic encaustic approach and inspiring instruction. When Ampersand first came out with Artist Trading Cards in Encausticbord™, Patricia jumped on board to try them and demonstrate a project for us. Ampersand first won my heart when I began translating my creative bent from mixed media work into encaustic on Claybord™. The luminous white surface, solid foundation and delectable option of a 2″ cradle all married beautifully with the ancient, yet contemporary feel of encaustic. Imagine my delight when I learned that Ampersand improved on this near-perfect relationship with new Encausticbord™ that offers the best of two worlds: R&F’s encaustic gesso paired with Ampersand’s expert wood panels and advanced coating technology. The use of ATCs or “Artist Trading Cards” arose a few years ago as the next big art movement. Exploding on the scene, potentially as the next ‘here today, gone tomorrow’ trend, ATCs have managed to gain a permanent foothold. Ampersand has embraced this tradable palm-sized art form and I find myself embracing these miniature delights right back. I jump with both feet into Ampersand’s delicious Encausticbord ATCs! 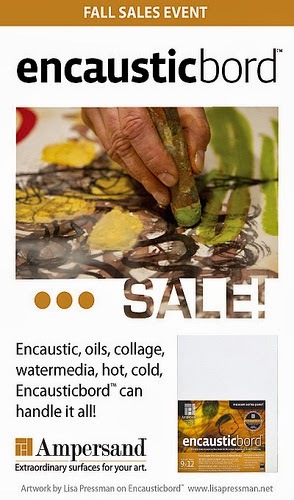 I adore R&F’s encaustic paints and mediums and put them to task here, along with Daniel Smith’s luscious oil paints. By choosing this triune of materials: Encausticbord, R&F Encaustic and Daniel Smith oils, I have assuredly set myself up for success! For this project, I worked on multiple ATCs at once which gave me the opportunity to hang them as a multi-storied group or to hand them out as individual ATCs (fig.1). After applying the initial priming layer, I placed chip board die cut letters over the entire group of 12 ATCs and sprayed alcohol inks over them to create stencil effects (fig. 2). Once the ink dried, I removed the letters. Then, using a natural bristle brush, I applied a layer of R&F’s encaustic medium (made from beeswax and damar resin) (fig. 3). I decided to paint stripes of R&F encaustic color across all the boards to unify them. I masked off the stripes with tape, painted them in with R&F color, then removed the tape while the wax was still tacky and then fused the layer (fig. 4). I collaged in Daniel Smith decorative papers (encaustic medium being its own wonderful glue) and then I fused again. For soft glazes of color, I rubbed on Daniel Smith oil paints and then wiped them away to show relief texture. Lastly, I dropped a touch of metal fleck glitter inside simple metal circles and melted them into place (fig. 1) This collection was inspiring to create. Enjoy!